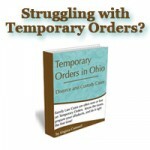 In Ohio, when a divorce case is filed, it is common for the court to put on a temporary restraining order. Sometimes, the order is only put on if a party asks for it, and the order is one-sided (the party that asks for it gets the order agains the other party only). This is currently the case in Franklin County. In other counties, sometimes the domestic court’s local rules state that the temporary restraining order goes on as soon as the case is filed, against both parties. It is important to understand the nature and limitations of these orders. They are not domestic violence orders, although they usually instruct the parties not to harass each other. They do not have any provisions that will require a party to give up their guns (unlike a civil protection order / domestic violence protection order). There is no allegation of wrong doing necessary to get these orders. These orders are simply put on to protect the status quo during the divorce, so that the parties remain relatively peaceful while they wait their turn for the court to end their marriage, divide their property and debts, and make orders regarding support and children. Among other things, temporary restraining orders usually restrain the parties from taking funds out of any of their assets except for checking accounts. This prohibits the parties from dipping into retirement, savings or anything else to finance their divorce. This can seriously disadvantage the party who did not plan for the divorce. One party has all their ducks in a row and the other is unable to afford their attorney. There are very few good solutions for this problem. An attorney can file a motion for attorney fees, but the attorney fees are not awarded often enough to address the problem or equalize the parties’ financial power, and when the fees are awarded, the awards are often minimal compared to the need. When people think divorce is coming, they are often afraid to financially prepare themselves for the divorce, because they are afraid that taking the money will hasten the divorce itself. That may or may not be true. Each client is in the best position to judge their own spouse’s potential reaction. However, when a client believes divorce is coming, they need to understand that a temporary restraining order is coming as well, and it may take a while to get to agreement, if agreement can be reached. 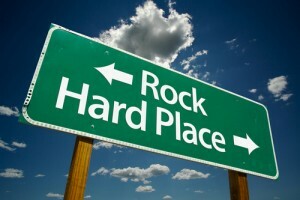 By failing to prepare for divorce, and for the temporary restraining order that will soon be limiting their access to their assets, people facing divorce are taking a risk of being the disadvantaged party throughout the entire divorce.